"Smee" redirects here. For other uses, see Smee (disambiguation). Edward Kipling as Smee in the 1924 film Peter Pan. Mr. Smee seems an oddly genial man for a pirate; Barrie describes him as "Irish", the only Nonconformist among Hook's crew, and "a man who stabbed without offence" – and is portrayed in the multiple pantomimes or movies of Peter Pan as a rather stupid but entertaining man interested in loot rather than Hook's more evil pleasures. Smee typically represents a humorous side to pirating, often portrayed as a portly man with a bulbous nose and red cheeks, although Barrie hinted at a darker side. When captured by Hook, every child in the brig loves Smee – he cannot lay a fist on them and does their darning – despite his belief that they fear him. Hook considers that Smee has good form without knowing it, which is of course the best form of all. He almost tears into Smee for this but knows that clawing a man for having good form is very bad form. Smee offers to save Wendy from the plank, if only she promises to be his mother – an offer she refuses, in Barrie's words, "Not even for Smee". Smee's position on the Jolly Roger is presented inconsistently (in a sense, it could be said that "no two 'Smees' are alike"). In Peter and Wendy, he is identified as the ship's bo'sun. 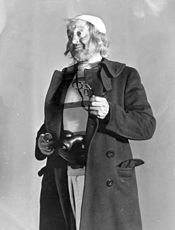 He is one of two pirates (the other being Starkey) who survive the final battle between the children and the pirates, and "henceforth wandered about the world in his spectacles, making a precarious living by saying he was the only man that Jas. Hook had feared." In Peter Pan in Scarlet, he has moved into the Underground Home of the Lost Boys. He leaves Neverland by the end of the book and opens up a shop in London that sells souvenirs collected from Neverland. Mr. Smee appears in Walt Disney's 1953 film version of Peter Pan voiced by Bill Thompson. In the franchise for this version, he serves as Hook's first mate rather than the bo'sun (although still sometimes shown to be a cook). Mr. Smee appeared in the 2002 sequel Return to Never Land voiced by Jeff Bennett. Mr. Smee appeared in Kingdom Hearts voiced by Corey Burton. Mr. Smee appeared in the Disney Junior TV show Jake and the Never Land Pirates voiced by Jeff Bennett. Mr. Smee appeared in the Disney Fairies film The Pirate Fairy voiced by Jeff Bennett. In the Disney adaptations of the franchise, Smee is shown to be first mate to Captain Hook. He is also Hook's assistant, which explains why he is addressed as "Mister Smee" by both the captain and the rest of the crew, although sometimes referred to as the cook. In the first film, he is never referred to as the first mate. However, he is confirmed to be this as he consistently acts as one to Captain Hook (though with varying degrees of personal loyalty). In Peter Pan and the Pirates, Mr. Smee (voiced by Ed Gilbert in an Irish accent) is Captain Hook's right-hand man. His weapon is named Johnny Corkscrew. He is small, but not very thick, has grey hair and pale blue eyes. His biggest difference from the other pirates is that he is often clumsy and not really able to capture one of the Lost Boys (as seen in "Slightly Duped" and "Play Ball"). In Steven Spielberg's 1991 film Hook, Smee (played by Bob Hoskins) and Hook's relationship takes on an almost intimate tone, at times even resembling an old married couple or a master/servant arrangement. Smee is allowed access to Hook's private quarters, is seen preparing meals for the Captain and even helps him disrobe before bed. When Hook threatens suicide, he makes it obvious that he expects Smee to stop him, to which Smee replies "not again". Hook also confides all of his darkest and most personal thoughts and concerns to Smee, seemingly exclusively. When Hook admits (untruthfully) that he wants to die, Smee embraces the captain and kisses him on the cheek to dissuade him. He also talks Hook into trying to persuade Peter's children, Jack and Maggie, to remain in Neverland permanently by using their father's repeated broken promises and prolonged absences as examples. Though Hook is successful with Jack, Maggie refuses to be swayed and retains her faith in Peter. Smee eventually abandons Hook when he realizes how much Peter loves his children. Near the end of the film, a man bearing a striking resemblance to Smee is seen sweeping garbage in Kensington Gardens but whether or not he is the real Smee is left unclear. Bob Hoskins reprises the role of Mr. Smee in the 2011 miniseries Neverland. Mr. Smee appears as William Smee in Once Upon a Time played by Chris Gauthier. William Smee is a man capable of procuring objects that are hard to find. In the Enchanted Forest, he makes a deal with Rumplestiltskin in order to get his life extended: a magic bean for his age reversal. Captain Hook, then the pirate Killian Jones, manages to intervene and kidnaps Mr. Smee to obtain the magic bean. He later becomes a crewman on Hook's ship (like the original Peter Pan story) as the ship sails off to Neverland where he and his crew will never age. In Neverland, Mr. Smee serves as an adviser to Hook, assisting in his murderous aspirations to kill Rumplestiltskin and his aspirations to obtain information and raise the newly arrived Baelfire. He worries of the crew being murdered by the Lost Boys who are searching for Baelfire whom the pirates had rescued from drowning. In Storybrooke, Mr. Smee appears as a homeless man who kidnaps Belle under the orders of Moe French (Maurice). When Mr. Gold (Rumplestiltskin) captures Mr. Smee to learn where Hook is, he states that he wasn't able to find Hook in Storybrooke. Mr. Gold later uses him as a guinea pig for a spell that would enable anyone to cross the border to Storybrooke without losing their memories again. When Hook does get to Storybrooke, Smee immediately begins following orders; he gives Hook Gold's most prized possession: Baelfire's shawl. In retaliation, Gold turns Mr. Smee into a rat. Following the Dark Curse's being undone, Mr. Smee was restored to human form as he was seen in the company of Hook and his pirates when they were robbing a stagecoach. However, he still has some side effects of being in rat form. Hook volunteers Smee to sail Henry to New York when Henry wants to run away from Storybroke to go home. Smee appears in the film Pan, portrayed by Adeel Akhtar. His real name is Sam Smiegel shortened to Smee. ^ Sneider, Jeff (13 March 2014). "Garrett Hedlund's Captain Hook Finds His Smee in 'Four Lions' Star Adeel Akhtar (Exclusive)". The Wrap. Retrieved 13 March 2014. This page was last edited on 20 February 2019, at 08:41 (UTC).